I first heard about Iona a couple of years ago while visiting Dublin and reading about Ireland’s most precious medieval artifact, “The Book of Kells.” The book is a stunningly beautiful manuscript containing the four Gospels in Latin, written on vellum (prepared calfskin) around the early 8th or 9th century and is on display at Trinity College in Dublin. 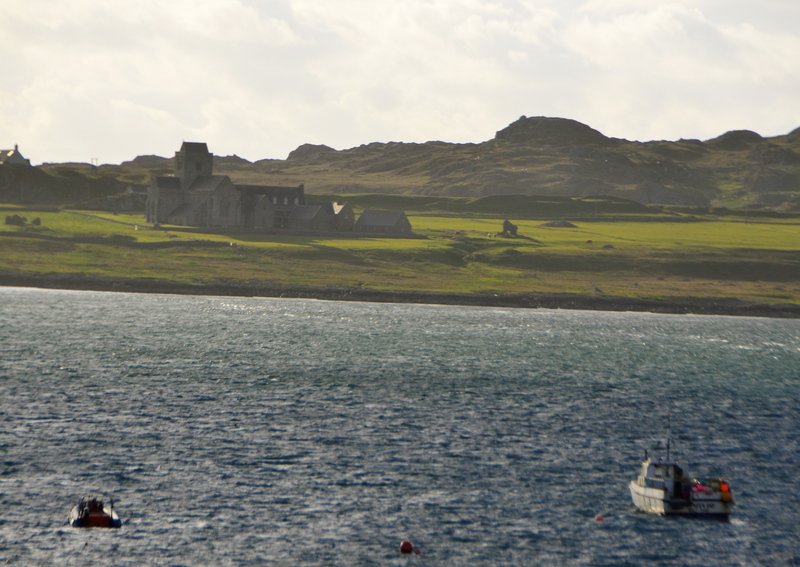 The place of origin of the Book of Kells is believed to be a monastery on the Scottish inner Hebridean Isle of Iona. 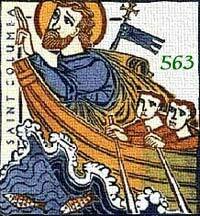 In the year 563, St. Columba, a Gaelic Irish missionary monk traveled to Scotland with twelve companions where, according to legend, he landed at a beach now known as St. Columba Bay. 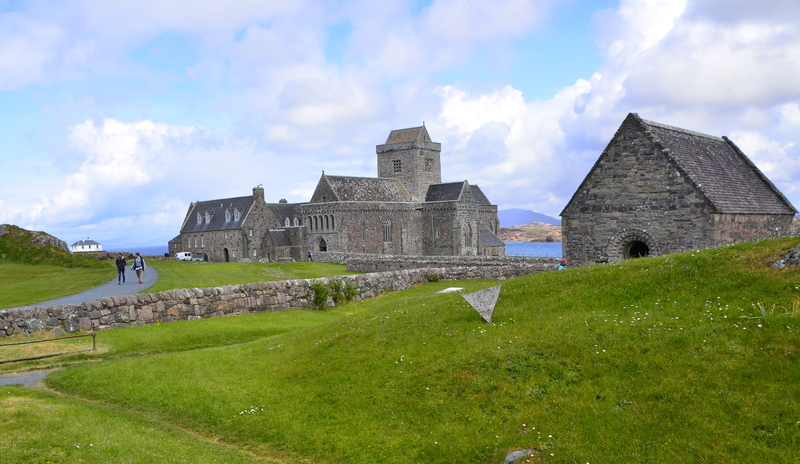 Shortly after his arrival he was granted land on the Isle of Iona where he built his monastery which became the center for his mission to bring Christianity to the Picts. 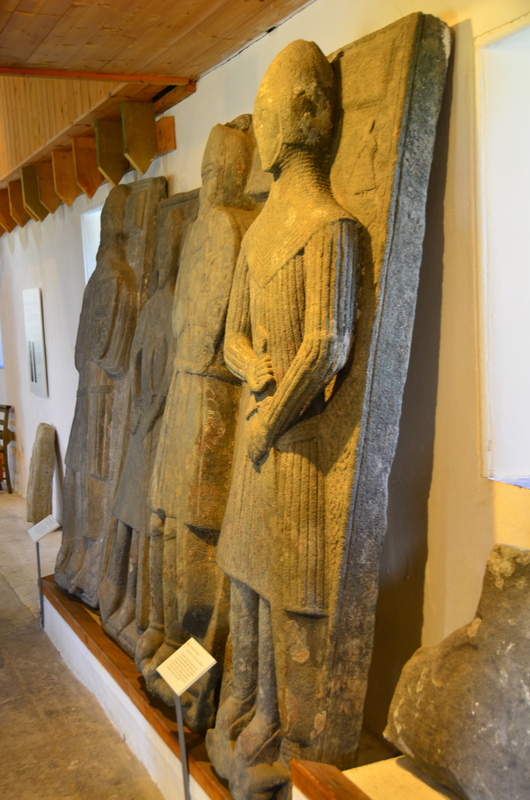 It was the Book of Kells that sparked my interest in visiting Iona. 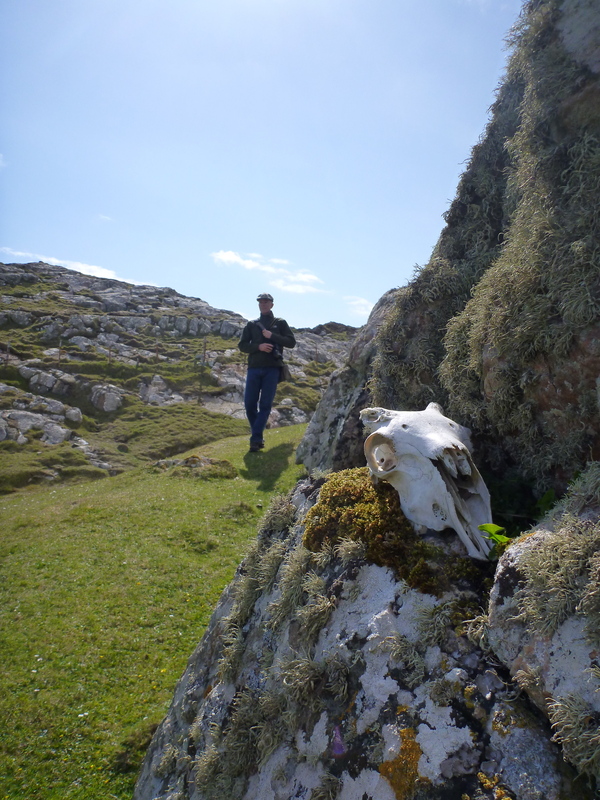 I’m not a deeply religious person but instead my love of art, history, and architecture, and the story of how religion has played such a huge part of Scottish history, was the driving force for my desire to visit Iona. 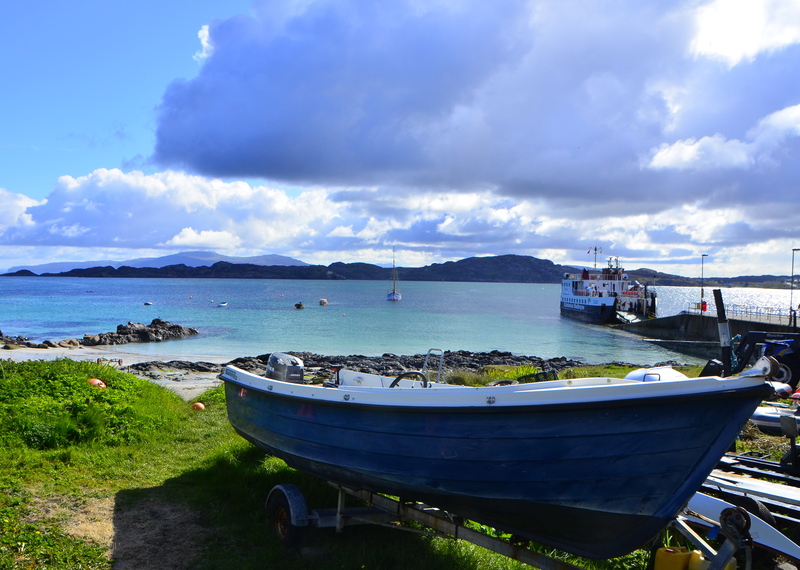 To get to the Isle of Iona from Scotland’s mainland, you must first travel to “The Gateway to the Isles,” the resort port town of Oban. From there you take a ferry over to the Isle of Mull to the village of Craignure. Next, drive 35 miles to the southwest arm of Mull on narrow single-track roads to another small village called Fionnphort (pronounced “FINN-a-furt”). We arrived to our B&B in Fionnphort in the evening and upon arrival, we were greeted by our wonderful hostess, Gillian, at “The Staffa House.” We all marveled at the stunning views of Iona Abbey just across the sound as the sun was setting. 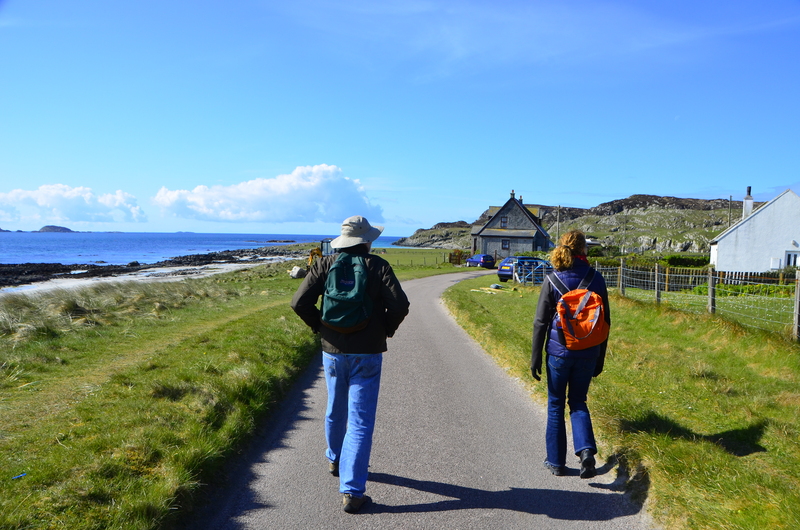 The next morning after a delicious Scottish breakfast at our B&B and interesting conversations with other guests, I headed down to the port with my husband and father-in-law to catch the 10-minute ferry ride over the stunning turquoise blue waters of the Sound of Iona. 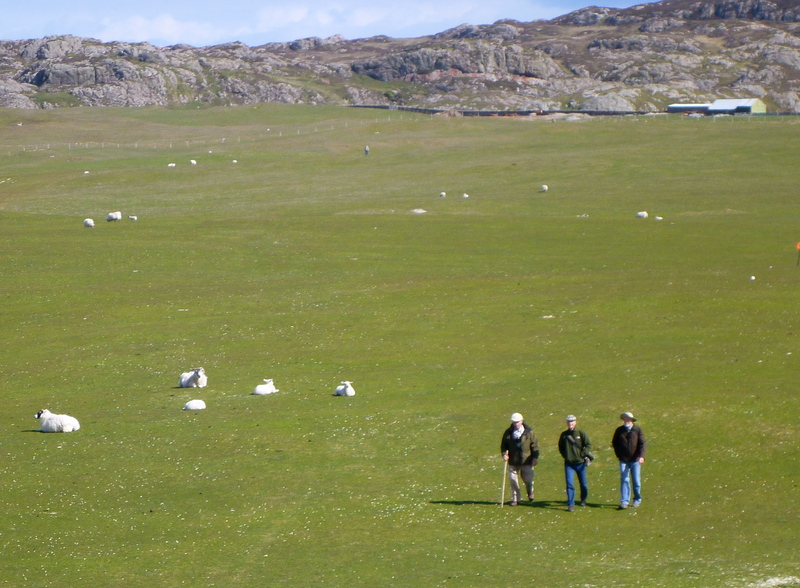 Iona’s current population is only about 125 people, and the island is only about 3 miles long so all the homes, shops, the Nunnery, and Iona Abbey are all short walking distances from the port. Looking back at the beautiful waters and view of Mull from across the Sound of Iona. 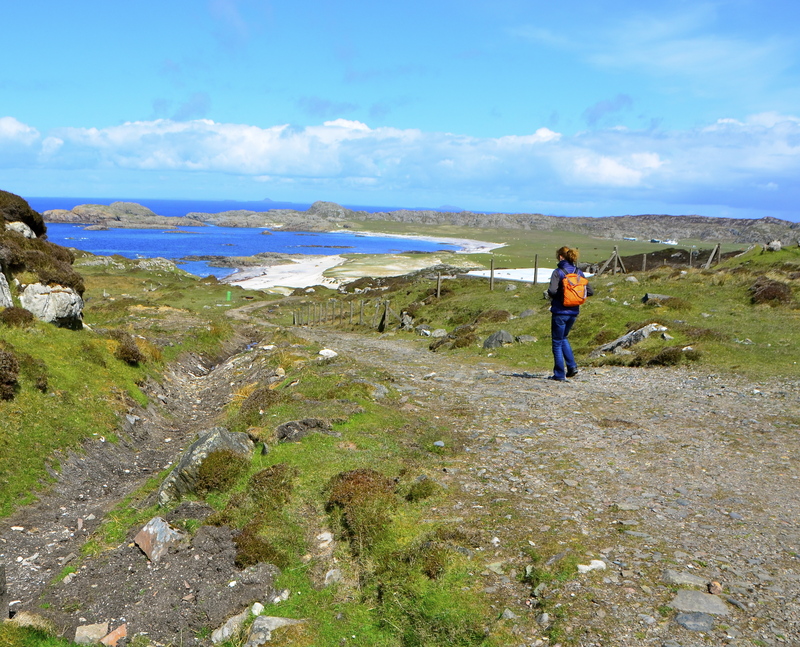 After being confined inside our rental car and on two ferries most of the previous day, we decided that a long walk over to St. Columba Bay would be nice. Gillian had given us a brief description on how to get to the bay but finding it on the other side of the island was up to us since it wasn’t marked with any signage. 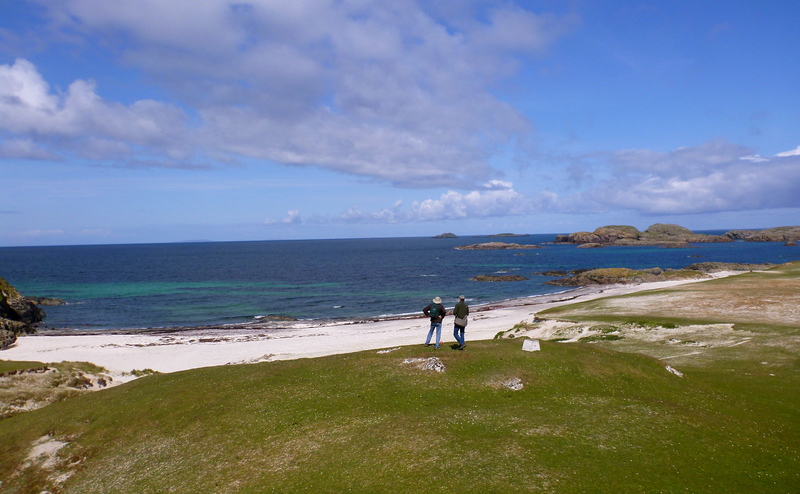 We stopped to enjoy the view from the Bay at the back of the Ocean from the fertile sand-dune grassy golf course tee and pasture called a Machair. 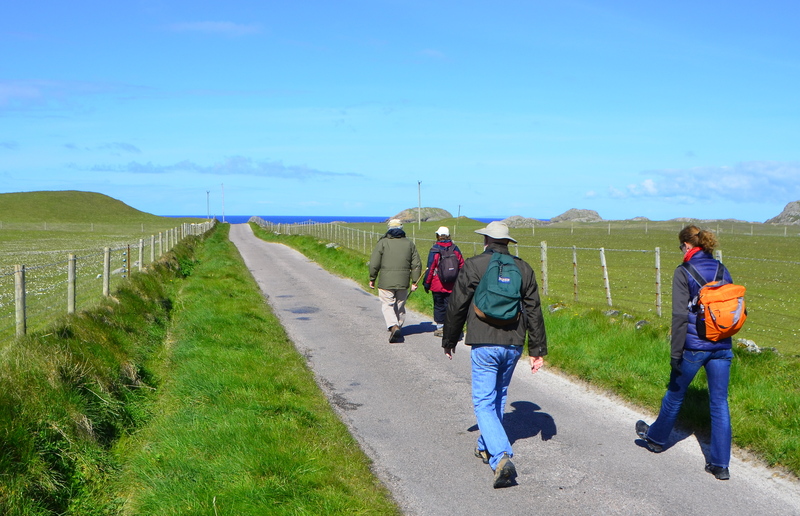 Along the way we met up with a couple of other pilgrims also heading to St. Columba Bay. 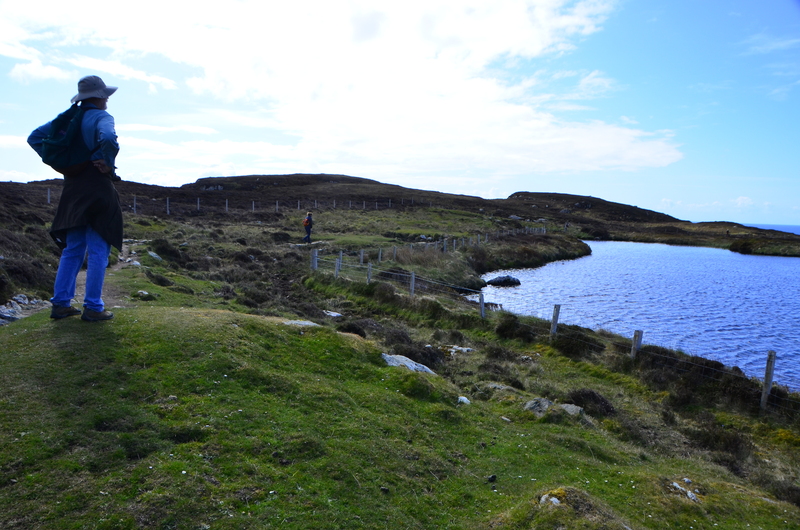 Once across the golf course we headed up the steep rocky path to the top of the hill and next to Loch Stanoig. From the top you can see St. Columba Bay below where from there it’s only a short hike on green grass down to the beach. 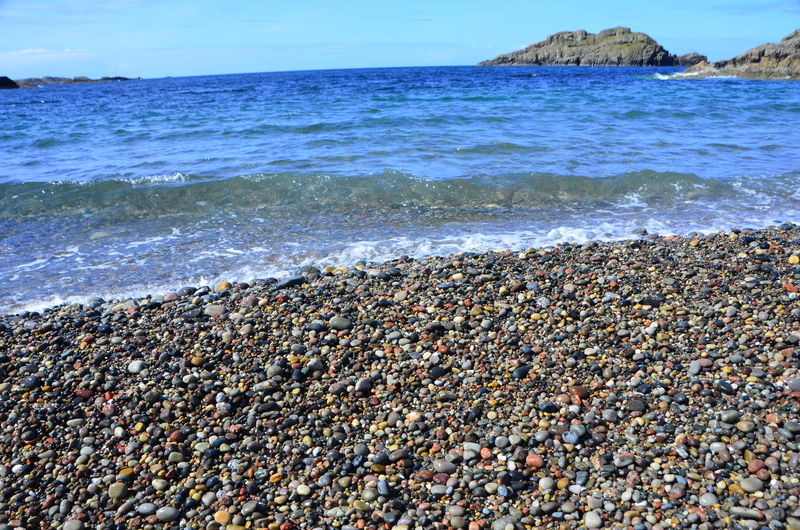 The sea shimmers an almost Mediterranean blue and brightly colored pebbles line the beach. According to legend, the green streaks in the Iona marble down by the beach represent St. Columba’s tears on leaving Ireland. 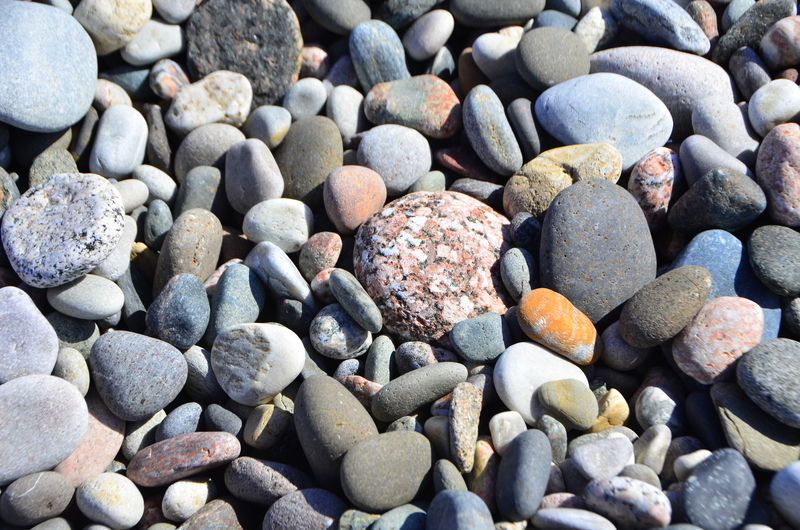 We picked up a couple of the brightly colored rocks to bring home. Especially prized are “St.Columba`s Tears” (some call them “Mermaid`s Tears”): small, teardrop-shaped pebbles of pure, translucent green. It is said that to carry one in your pocket is a protection against drowning. I didn’t know about this until after the trip when we got home. I was surprised to discover that the only rock I kept for myself from Iona was a olive green piece of Iona marble shaped like a teardrop. 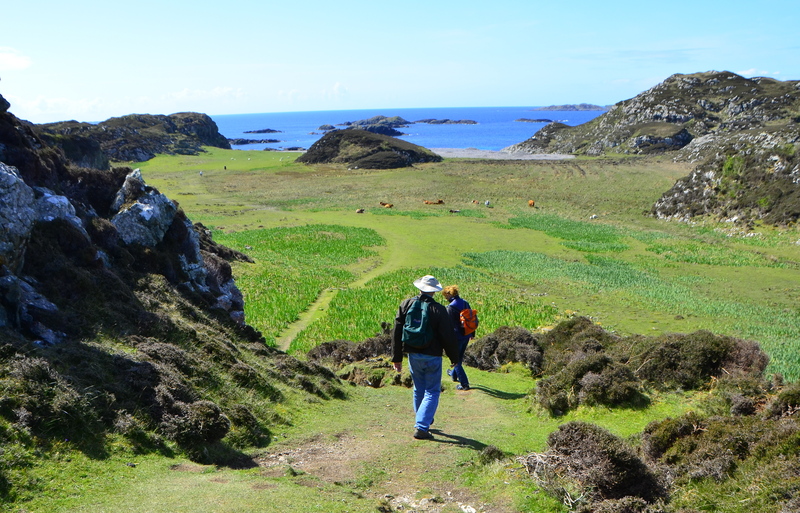 After enjoying the first sunshine and warm day since being in Scotland, we retraced our steps back up and over the rocky path and down to the main village to find some lunch and visit the Nunnery and Iona Abbey. 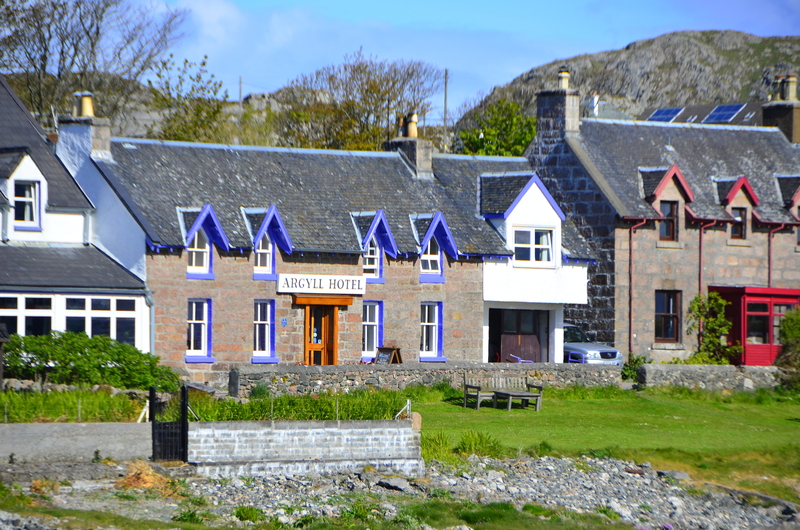 Lunch was outside at the Argyll Hotel, with views of the Sound of Iona. 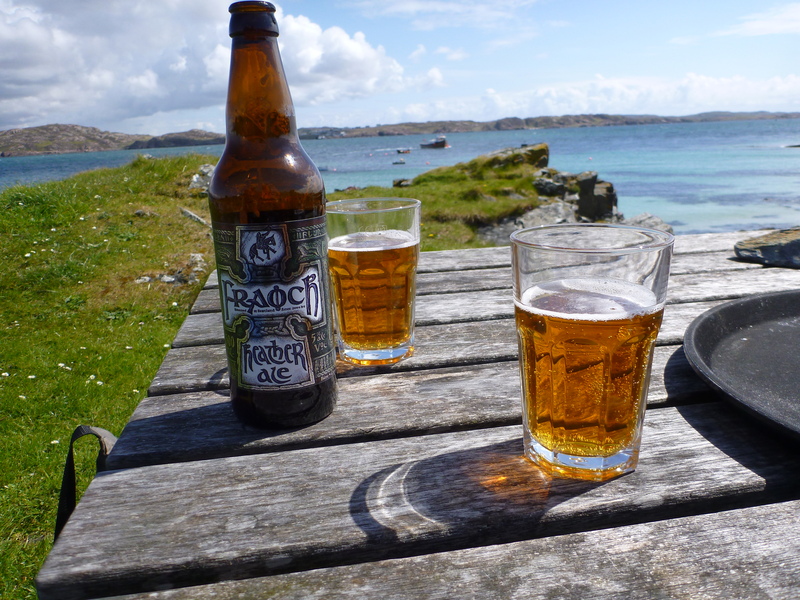 While waiting for our salads made with organic vegetables grown on the island we enjoyed a cool Scottish beer made with heather. The Nunnery was built in 1203 by Reginald MacDonald, the then Lord of the Isles, and has not been restored since becoming derelict during the Reformation. 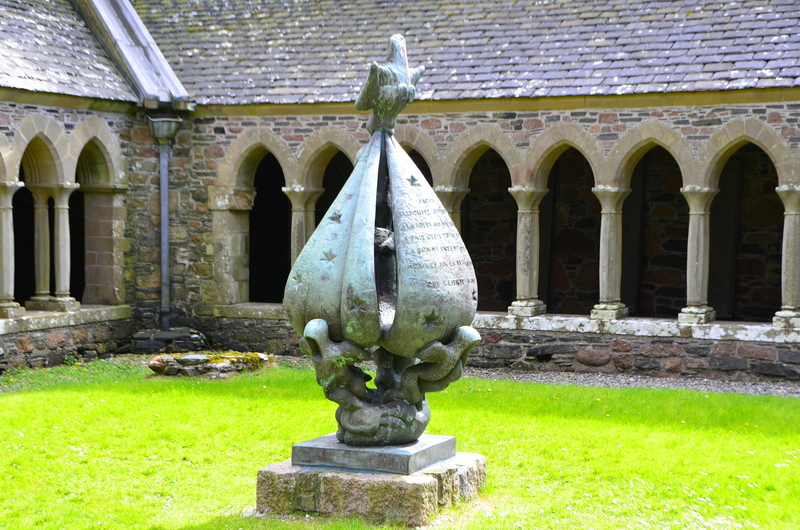 The pink granite walls that remain are amongst the best examples of a medieval nunnery left in Britain. Along the path to the Abbey we came across “Maclean’s Cross,” erected around 1500. 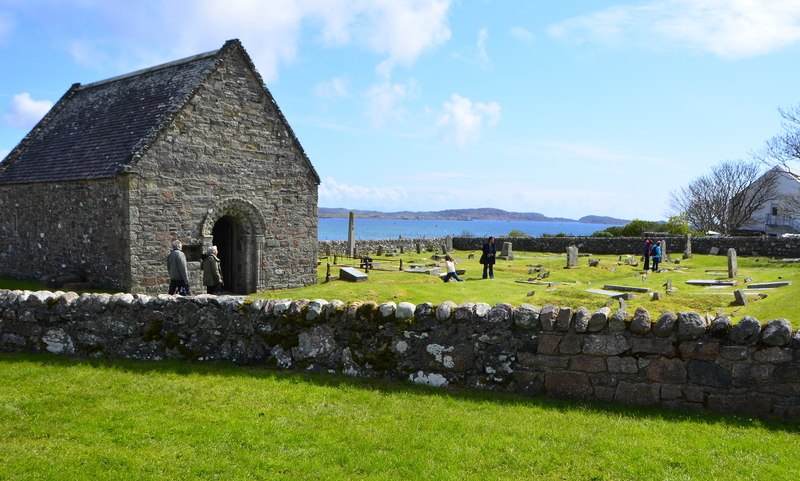 During the Reformation all but three of the 360 carved crosses on Iona were destroyed. 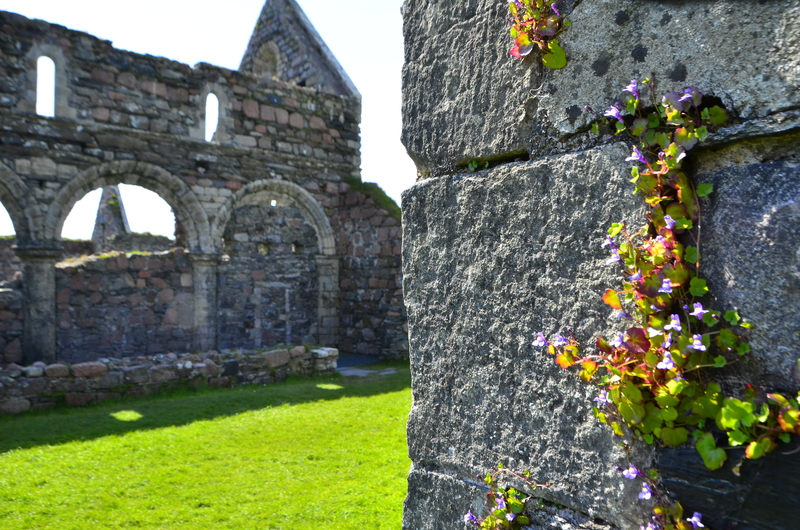 The Iona Abbey is one of the oldest and most important religious centers in Western Europe. 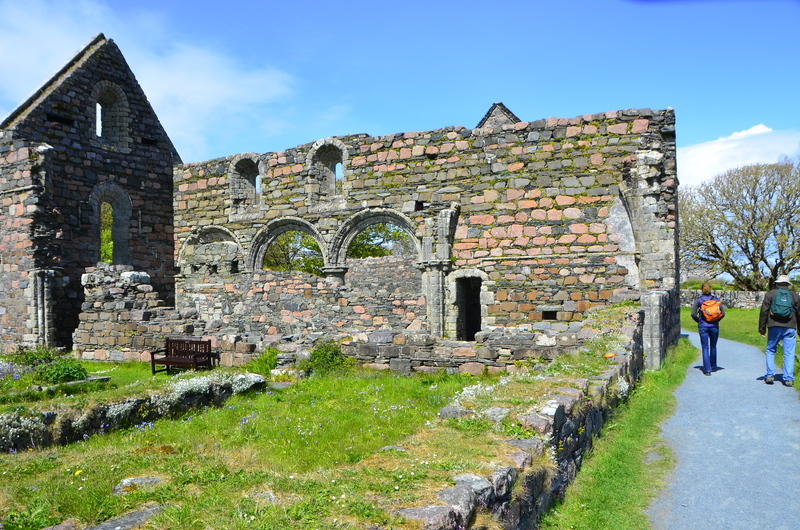 After Columba’s death in 597 AD, Iona became a place of pilgrimage, but Viking attacks in the late 8th and early 9th centuries destroyed the monastery. 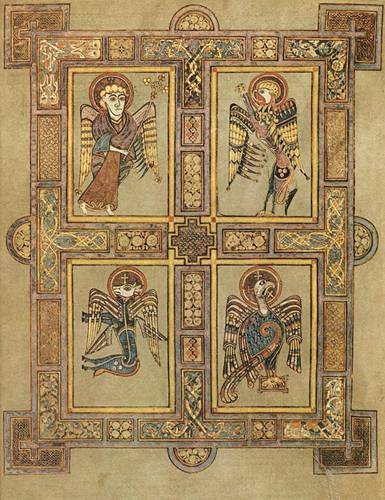 The Book of Kells was probably produced in the monastery to honor Saint Columba in the early 8th century but after a Viking raid the book was moved to Kells, Ireland. The Abbey you see today is a modern restoration from 12th century construction when the Abbey was rebuilt. In front of the Abbey stands the 9th century St Martin’s Cross. The ancient burial ground, contains a restored 12th century chapel. The abbey graveyard contains the graves of many early Scottish kings, as well as kings from Ireland, Norway and France. In 1549 an inventory of 48 Scottish, 8 Norwegian and 4 Irish kings was recorded. After a full day of seeing Iona we boarded the ferry back to Fionnphort. What history in such a small place, and we didn’t see all of it! Maybe one of these days I’ll be able to visit again. Beautiful photos! Can’t wait to make a trip there!